Contains Over 1000 Russian & German Language Phrases for Fast Language Learning! If you have always wanted to learn the Russian or German language but have no time, pay attention! Russian and German are beautiful languages that are spoken by millions around the world! It is hard to find time to learn a new language, however! Language courses at schools and colleges are routine and boring! Learn Russian & German for Beginners Easily & in Your Car is perfect for people who have no other time to learn a new language! It contains more than 1,000 common German and Russian phrases and words that will help you in everyday life and travel! Each phrase is pronounced slowly and multiple times so you can really learn the correct pronunciation! Each word's equivalent English translation is also provided! For the kids at school? Also comes with a free PDF of the entire text delivered directly to your library! Immersion Language Audiobooks has helped thousands of people learn a new language - be one of them today! Got it for my friend as a gift and she said that she loved it and that it really helps.Excellent book!The recordings are very clear. I would say this course has the most detailed explanations of any course I have seen. This course is absolutely worth the money.I am happy with this purchase. Easy to read and pick up on Russian almost immediately! Every course is different and seeing things from different angles helps a lot. Well structured course, easy to follow, just need determination.It is great for driving to work, there are a few places that they give the wrong translations. I have a decent understanding starting off, and I am sure if you did not you would get it eventually, but there are times that the words they use to translate aren't as good as they could be. They also don't really tell you what the words mean, so much as the phrase itself most of the time. Still a great tool if you are trying to learn the language. I just love those audiobooks!! Great solution to my condition: spending so much time in traffic. This is a complete course! 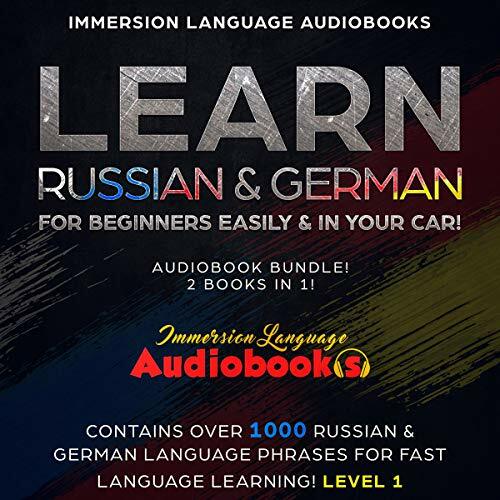 !this comes with actual workbooks,It introduces many of the Russian & German Language Phrases with writing exercises and dialogues/conversations for listening and speaking. The Living Language coursebook presents information that is more digestible and is a good supplement with something else. I got it for my friends who want to learn Russian. Whoever gets this book have to keep in mind that this is a COMPANION for an audiobook,.you can easily repeat everything.A really good way to learn some vocab, for a beginner at least. I wish they would do more of those books without any pointless English talk in between the Russian & German words. This is a great book for those brand new to the language. It is geared towards visual learners, so if your preferred method is through audio, do not expect this to work at its greatest efficiency for you.Easy to understand, words are clearly enunciated. I studied Russian intensely many years ago and have been recently dusting it off. This audiobook has been very helpful for clearing out some cobwebs.I think this is a very good production. A bit sceptical at the beginning but it exceeded all expectations.I haven't even finished it yet but I am highly impressed. it is a simple but effective learning method that will have you speaking Russian & German in no time.Good to cover some of the basics of German but some more depth would be nice. Content is great and execution is perfect. just need more of it to keep learning.Really good, ended a bit soon but I would recommend it. it does explain and cover the main basics.This course is brilliant and manages to explain even the notorious German Phrases in an accessible and engaging way. I only wish there was more. I have taken course before but this course really provides a solid foundation for learning German. I think it is particularly suited for a native English speaker because it is easy understand his method of teaching how the language works. I started with nothing and now have a grounding to build from.Great audiobook, takes a very simplistic and repetitive approach to easily explain complex German Phrases .I started with nothing and now have a grounding to build from. If you're a complete beginner. this isn't for you. it's just a gentlemen saying different phrases twice and with no explanation, nor breaking down the phrases to explain what each word is. Good luck.This is one of the clearest. I bought it for my boyfriend and he loves it. He spends a lot of time driving so he listens to it while on the road. I'm a native German Language speaker and I find this system to be very complete. The accent is pretty neutral, I totally recommend it; and the price is great! I thought that this book might be too elementary for me because I have been self-studying Russian & German for the last several years. However, I find it very useful, because it has lots of Words & Phrases! many tips which I guess I missed in my studies to date.I had never studied German before listening to this audiobook, I was quite sceptical to what a few hours of lectures could do but I am truly impressed. I appreciate the audio, but the book lacks vocabulary and has very limited exercises.he Kindle edition works as good supplementary material.If you use this e-book, i hope you will be happy,The young man who narrates it speaks clearly and it's very easy.I find this a good refresher course for my needs, to relearn the basics and go on from there. After I finish listening this book,I believe I'll be ready to talk Russian & German Language .I recommend this book to anyone who is a beginner, or who wants to brush up on their Russian & German. This is a nicely written book. Lessons are well arranged in a step by step process, especially the Phrases part.It is well worth using as a guide to the language.Lessons are brief and well organized. Explanations and examples are clear. The exact basic course that I needed, reviewing all the Phrases with clear explanations and examples. Perfect for a good start and a good understanding of the grammar Words & Phrases!of the Russian & German language.I do wish, though, that there were more exercises for self-evaluation. This book is easy to follow along with. I am finding it helpful in my studies of Russian & German.I have found answers to questions about Russian & German Words & Phrases! more easily than from many other expensive guides. Gives you just enough information to understand the common forms and structure.Love this =) using it to learn german!. Each Words & Phrases! word is used in a sample sentence.A nice eBook for the money. I have studied German for many years and also taught it at the high school level and believe this audio book would be a great book for a do-it-yourself to begin learning German. I found this a great way to learn and the explanations on why the language does this or that make it easier to make sense and to understand easier- the narrator has a very calming voice and it all really sinks in - great audio book! Very helpful. I have a much better understanding of the structure of the language now. And the pronunciation.This audio book was extremely helpful in my preparation to visit Germany. I instantly remembered what I had learnt from school, as well as learn new phrases, words, and corrections to my pronunciation.I found this course extremely helpful! For any friend looking to learn German I'd certainly recommend this course. Its pace is nice and slow with thorough explanations and repetition. Some reviewers say it is rather patronising, and I can see what they mean. However, I take no offence at the simple questions, which can have very easy answers, because it provides a firm foundation that does not leave me lost as it begins to get more complicated. Fantastic way of learning, well explained and structured. Would enjoy the advanced version if available .easy listening whilst driving, finished the course then went back to review . learning the art of constructing these sentences means be able to learn new words and being competent enough to add them in the correct place to be understood.